Large composite tree planters are custom coloured for the Westway Development Trust, London. 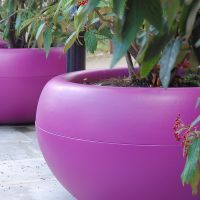 IOTA’s Boulevard planters are used to enliven communal spaces at two leading London universities. 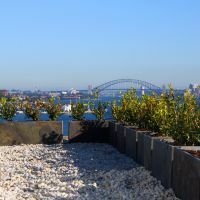 IOTA’s Slate planters feature on the roof top of a private residence in Rose Bay, Sydney. 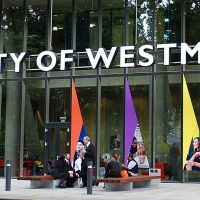 Bespoke galvanised steel planters are commissioned for the City of Westminster College. 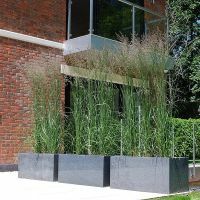 IOTA’s Granite planters were selected for this imposing weekend residence in Buckinghamshire. 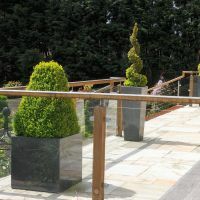 IOTA’s Granite planters feature in a landscaping scheme for a prestigious, ultra-contemporary residence. 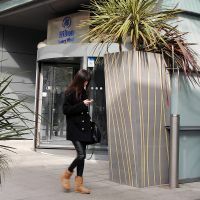 Bespoke powder coated steel planters are commissioned for the new Hilton Hotel in London's Docklands. 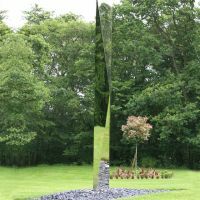 An imposing 4m (13’) tall garden sculpture in mirror-polished stainless steel, available by special commission. 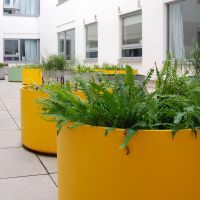 IOTA’s Boulevard planters are used to green a strikingly modern courtyard space at the heart of the hotel. The LOOP Chair features in the most talked about garden of Chelsea 2011, the Irish Sky Garden by Diarmuid Gavin.